Founded in 1938, Steak and Shake still maintains a classic Drive-In Diner feel. Even though the one I ate at, is in a strip mall in downtown. They have unfolding paper toys for all ages to keep the small and loud ones entertained, and photographs in black and white of their vintage past. They’re advertising features glass glasses for milkshakes, but they are delivered in paper. That feels more like conventional fast food experience to me. Meat tasted like actual steak section of the cow, and these are Steakburgers they are selling so it ought to. Friendly service, and handy accessible location to various events in downtown Seattle. And before we get into the actual flavor of the steak and shake, something of note about Steak and Shakes that I did not get you before. These premises are on the same block as Wild Ginger (Voted #1 Asian Fusion Eat) but if you go downhill along the same block, you find a Seattle Art Museum. Seattle Art Museum has on the first Thursday and the first Saturday of any given month, free admission. Both of which are on Emerald City Comicon Weekend. The tickets are good for seven days, and they can be used at Seattle Asian Art Museum at Volunteer Park. So if you need a break from the convention, or in this case Comic-Con, you can enjoy some free culture and art. The milkshake I had was the limited edition Red Velvet cake shake. Thusly I wondered how they flavored it. Then I noticed that the shake felt kind of granular to me, and once I was through that cherry and the cream, I saw they had blended in crumbs of actual red velvet cake into the mixture. Beyond that, all I can say is that the whip cream was unflavored, and the marashino cherry, aside from having those stem, went down a lot easier than I’m used to. I’m normally not a cherry guy, but at least this one had no pit. The shakes had an interesting caveat to them. For the sake of exploring I bought a “plain” Red Velvet shake. You can buy them at their regular price, or you can pay extra to have additives like the regular milkshake flavors. What is unusual, is that the Oreos don’t cost extra… the Oreos are a sort of freebie. Throw in literally any of their other typical shake flavors with the cake ingredients, and you have a small upcharge. This red velvet flavor will be around through Comic-Con but not as far out as Sakuracon. My entree was their Quacamole burger. The Guac Burger was actually pretty spicy they mentioned the spicy mayo is available on the side period for dipping fries in. If you ask for no fries and which I did, your order is $0.70 cheaper. I really couldn’t taste much of the guacamole, course I will through it pretty quickly. And I was glad I could not taste the raw tomato. Normally I’d ask tomatoes like that grilled or removed, but no substitutions when you want to write about the actual product. Two patties, and you can taste the steak in this. They said it’s all made from scratch here and I believe it. The sauce, the burgers, and the guacamole. Definitely made here made fresh, and actually quite prompt for freshly made. Normally I associate this speed of service with just reheating frozen patties. Normally when I have a guacamole burger there’s a huge mess left behind but only a few droplets were left. Easily cleaned. So I managed to get all of my money’s worth. https://nortonsafe.search.ask.com/search?chn=&ctype=maps&doi=&geo=&guid=&o=APN11908&p2=%5EEQ%5Ecd00us%5E&page=1&prt=&q=Steaknshake+Seattle&tpr=10&ver= Navigate the area online in advance. So, one night I had to duck in from the cold. And this is going to be very relatable come Emerald City Comicon and when it might actually still be snowing. It is snowing here as I dictate this. It is below freezing in Seattle. Winter is extending, and winter is coming. To a place where people actually dress up as white walkers. That’s going to look so freaky in the outdoor shots. But here’s a problem, liquid is one of the words in LCD screens. So when it gets too cold, things like digital cameras stop working as well. This and that, it’s just you deserve a heads up. Don’t be out too long with your camera if you want to keep using it. But storytime’s over. This is actually about a drink. 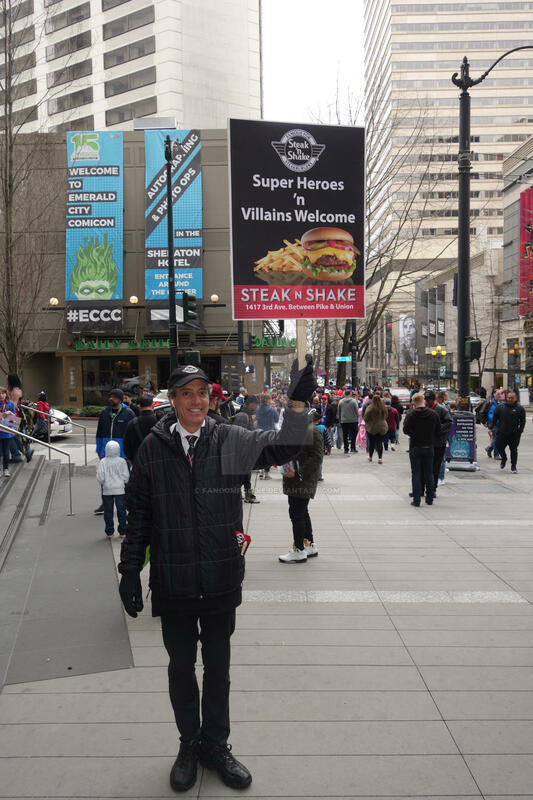 If you’re over budget and you need something hot, I’ve already detailed that the convention center in downtown Seattle is surrounded by various Starbucks here: https://fandomfoodie.wordpress.com/2018/01/09/star-shells-or-half-bucks-part-1/. Just order a Venti Hot Water, 3 or more slices of lime and 8 cane sugar packets. You let it all steep and melt together, and you have the Evergreen Hand Warmer. Does wonders to protect your hands from the cold. And if you’re going to be operating a camera like me, you’re going to need your fingers exposed. So these little things will really come in handy. The actual taste is more like scalding sweet water with a kiss of lime than anything else. But given the ingredients for portions, that’s not surprising. I suppose if you wanted more you could get it in a reusable cup. Or just hold on to those lime wedges and get a hot water refill with more limes. Honestly I like it for both flavor and most importantly warmth, but my dentist will probably disapprove. Lots of sugar and citric acid, period. Although given how many calories you’re going to need to maintain your body heat, you’re definitely going to need the extra calories. I’m not exaggerating. Speaking of maintaining body heat, who’s going to be toughing out the cold in their cosplay this year? I’m going to be skipping it for Comic-Con this year. One week out as I write this and we still have some snow on the ground. See you there, hopefully without chattering teeth. It and Cherry Blossom fraps. If you are ordering multiple Frappuccinos, make one of them the new(ish) It frap. It placed an emphasis on Pennywise’s new red and white color scheme, and it is mercifully simple. Especially when you pair it with the much more complex Cherry Blossom frap. The chaste itself gives off the strawberry field before I even when you just have your straw at the very bottom although I had to walk home with mine first as shown in the picture. So it may have had some time. Personally I think it is better for it. But I’ll have to order another one to be sure. Not that I would mind. So the vanilla bean vanilla bean frap glorified is Gathering the actual Bean Moss around the edge of the cup bottom. And my only remaining advice is ask for the freeze-dried strawberries as a topping because it showed in the picture on the secret menu website, but not in the recipe.? How is that? Well the movie came out after sakura con and Comic Con last year. And this spring time after a movie hits you’re going to see a lot more cosplayer stressed after that movie. So if you’re going is Pennywise, any Pennywise the Clown, you can add your experience by drinking Pennywise. Years ago at my old account, some of you will remember me sharing my thoughts on the Sakuracino at Sakuracon with you. The original. And I’ve had one each year since. So, when I discovered a Cherry Blossom Frappuccino, I was intrigued to explore something like we could order all year round. Unlike the Sakuracino which calls for a special syrup added into the whipped cream. Which is much like the zombie frap that I tasted but didn’t get notes on for all of you. My bad. The Sakuracino changes, constantly adapting and evolving each year. But this lets you switch things up a bit and impress your fellow attendees. Although the recipe is a bit complicated. If you recite it item-by-item instruction by instruction, that is impressive and it sounds crueler than it needs to with regards to the barista. Ugly wood go big or go home on your orders. But now for the actual flavor. I cannot tell the matcha from the strawberries. At least not after I weights following several big ships. Now I like both, so that’s a good thing as far as I’m concerned. But it makes describing it’s a bit of a challenge. The sides are lined with white mocha and matcha mix, and they dissolve into drink very quickly. The Shamrock was minty of course, has all Shamrock drinks are. At this point I’m surprised they don’t have Shamrock tea on the shelves. I wonder if real clover is actually edible. I know there’s clover honey. Maybe you could throw actual honey into a shamrock drink once in a while. Because Clover and Shamrock I’m under the impression as I dictate this plant. Of course given the American Honey shortage, and that the price is kept stable by importing (potentially) poisonous Chinese honey, I’m glad they don’t go that route. And it’s not racist, just my thoughts on their health and safety standards. Lots of heavy minerals in there: http://www.foodsafetynews.com/2011/08/honey-laundering/#.WozaM6jwaUk. But enough about why things should not be a certain way they already are not. Let’s see how I think of the actual flavor. The minty taste reminds me of the way that matcha powder generally tastes minty in the first place in a Starbucks frappe. Yet toppings on the whip cream or just skip the whipped cream. These are both specialized whipped creams in the recipe, and the odds of a native Starbucks store having the mixed whipped cream ahead of time are very low. So just chop your Shamrock whipped cream and matcha powder guess that’s green anyway, and your Pokeball whipped cream in strawberry puree and dried strawberry slices period or just skip it would be better for you anyway. Although they might be around in time for Comic-Con, because comic cons of beginning of March and St. Patty’s Day is in March. Star Wars and Pokemon Fraps for cons. The Pokemon Go frap has nothing in or about it that brings to mind Pokemon go, but it does have a picture of Mewtwo next to it (on it’s Secret menu page). I am aware that in 2018 this is a little bit dated, but I felt it was more convention appropriate then something based on Girl Scout cookies (there were three Girl Scout Cookie-based recipes I found on the secret menu, and they sell at con). Will get to how to get your fix without palm oil when they start returning to the streets. I have something unique in mind to address that with hot cocoa. But onto the frap itself, the frap is rather tart. Which is not surprising given the raspberry syrup and whole blackberries blended in and added to it. It is still plenty sweet though. I’m actually glad there were no additives to whipped cream, I’d like to just focus on the frap flavor itself. But the standard taste of whip cream does not detract from its or hurt. The Green Master tastes a lot like coffee. I can’t make out the caramel or matcha powder nearly as much as the job of flavor, and my barista accidentally added chocolate sprinkles to the mix, but I’m not complaining. I’m not going to waste the whole thing because one (extra) ingredient is off. Free drink, after all. Honestly I think they suited it just fine. Especially on account of the Java in this. The neurostimulants topped with sugary caramel, sounds like an ideal Kickstart for a force-user, given how much brain power it must take to suppress that much emotion while retaining that much Focus. Well, that’s it for a while. My giveaway week to get free Grande handcrafted drink with every sandwich ended before I could post this today. So I’ve got some sandwiches to stockpile for my new for work for lunch at my new job, I’ve sample and written up a bunch of fraps for you based on popular culture you’ll likely encounter at these conventions, probably at one of the Starbucks below Seattle link and have a great Emerald City Comicon and Sakuracon.